You can feel it, the hairy month is quickly approaching. To those of you who have already familiar with Movember, this is the time to give your razors a break. To those whom have always wondered about the scene of hairier men during this time of the year, you are not alone. Gender is one of the most consistent predictors of health and life expectancy; For men, this is not good news. Movember is a global movement committed to tackling the big issues affecting men’s health, encouraging men to stay healthy, and working toward a world where men are more open to discussing ‘the big stuff’ in their lives. There are three urgent men’s health issues: prostate cancer, testicular cancer, mental health and suicide prevention. Support our cause by donating to Movember under UFIT’s team. Help us raise funds to help our sons, brothers, fathers, partners and friends from dying too young. Find out more at our flagship personal training studio at Amoy! Grow a Mo, and advocate for Movember this month! Not keen on growing a Mo, but still want to do something good this Movember? Spread the awareness on your social media! Mention us in your posts and so we know and can help to address various queries your connections might have! Hashtag #UFITxMo on Instagram to see your feed appear at the bottom of the page! Get active and row to grow awareness for Men's Health! 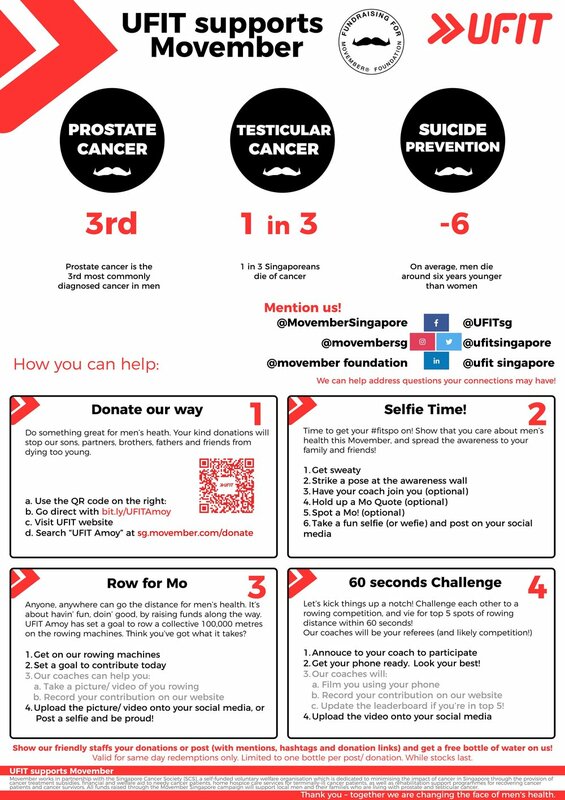 Join us at UFIT to contribute a collective 100,000 metres in our campaigning for Movember. Participants can redeem a free bottle of water for their efforts. For the competitive, join in the 60 seconds row challenge for a place on the leader-board. Come on down to our flagship gym to find out how else you can participate! Open to all clients, staff and the public coming in for a trial!